A committed relationship, as most people see it today, is a relationship of equals who share values and goals, a kind of team united by love, a common purpose and philosophy, and dedication to each other's growth on many levels, including spiritually. However, we have failed to recognize what a brand-new model this is in the history of the world. We need new guidelines that are rooted in sound understanding of our modern psychology and dilemmas. Young-Eisendrath makes the stand that modern relationships, which demand equality and reciprocity, cannot resort to dominance, control, or trust-breaking. We must learn to ongoingly renegotiate conflicts and needs with our partner, rather than bailing out at the first upset. Drawing from her many years of Buddhist practice and teaching and her work in psychotherapy and couples counseling, Young-Eisendrath shows how mindfulness is the key. Her insights and clinical examples are supported by practical application through the provision of mindfulness-based practices, exercises, and dialogue formats she has effectively used in couples counseling. You may not always like the hard truth in what you read, or you might even disagree at times, but Young-Eisendrath is willing to not only dismantle our idealized projections about love, but also offer a way forward to bring our intimate relationships on the spiritual path. The modern committed relationship is under stress--we want love and attraction as much as equality and reciprocity. A key figure in mindfulness and psychotherapy shows how to bring mindfulness to the unique kind of relationships we find ourselves pursuing today. A committed relationship, as most people see it today, is a relationship of equals who share values and goals, a kind of team united by love, a common purpose and philosophy, and dedication to each other's growth on many levels, including spiritually. However, we have failed to recognize what a brand-new model this is in the history of the world. The old archetypes and myths and the reductive biological models do not provide adequate guidance for relationships based on "personal love." We need new guidelines that are rooted in sound understanding of our modern psychology and dilemmas. Young-Eisendrath makes the stand that modern relationships, which demand equality and reciprocity, cannot resort to dominance, control, or trust-breaking. Valuing being "true to yourself" in a relationship means we must learn to ongoingly renegotiate conflicts and needs with our partner, rather than necessarily bailing out at the first upset. Utilizing wisdom gleaned from her many years of Buddhist practice and teaching and her work in psychotherapy and couples counseling, Young-Eisendrath shows how mindfulness is the key. Her insights and clinical examples are supported by practical application through the provision of mindfulness-based practices, exercises, and dialogue formats she has effectively used in couples counseling. 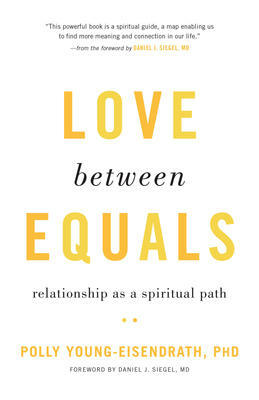 You may not always like the hard truth in what you read, or you might even disagree at times, but Young-Eisendrath is willing to not only dismantle our idealized projections about love, but also offer a way forward to bring our intimate relationships on the spiritual path.